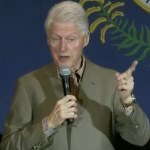 Former President Bill Clinton — who will be called upon to help revitalize the U.S. economy if Hillary Clinton wins the presidency — made two inaccurate economic claims in a recent speech in Kentucky. Hillary Clinton says the U.S. economy does better with a Democrat in the White House. 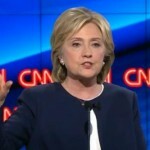 But a report cited by her campaign as evidence doesn’t give credit to Democratic fiscal policies.